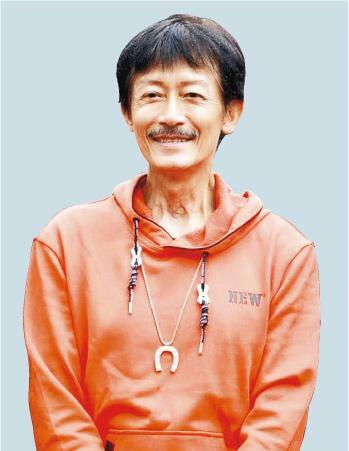 The 65 year old actor and director Frankie Chan Fun Kei last year was diagnosed with Anaplastic Thyroid Cancer and after a period of treatment beat the disease. This month he resumed work as he directed the film MEI LAI JIN JUNG (BEAUTIFUL WAR). The film two days ago officially started production in Jiangsu. Actors included Kenneth Ma Kwok Ming, Patrick Tam Yiu Man and Jessey Meng. Chan Fun Kei said about his cancer fight, "Now my voice sounds like (Eric) Tsang Chi Wai's, the cancer cells destroyed my vocal cord. I thought I was done for. The doctor said that patients with this disease typically only had two months to live." Luckily Chan Fun Kei created a miracle with will power and active treatment. "I had several dozen radiation therapy, I lost all the muscle and was left with half a life. In general after radiation therapy chemotherapy was required, I didn't want to lose all my hair after chemo. Later a friend recommended a treatment and finally I got over it." After recovery, he often told his friends' I remember Tsang Chi Wai told me and Jacke Chan, 'Even Ma Yun is only managing wealth for others, can you take the money with you? You should spend all the money while you are alive.' I though Chi Wai was right." Chan Fun Kei reportedly criticized Cecilia Cheung Pak Chi's work ethics while working on LEGENDARY AMAZONS. He clarified, "Pak Chi's performance was great. I remembers when something hard hit her face in a fight scene and she was swollen, she still insisted on continuing the shoot. She was very tough and I really admired her!" Cheng Pei Pei said that while working on the film she was constantly waiting for Pak Chi. Chan Fun Kei said, "Pak Chi at the time wasn't feel too well, so when she wasn't in a shoot she would remove her armor and get warm inside a heated vehicle. Putting the armor back on took time. I understood that, I don't understand why I am always rumored to feel that Pak Chi destroyed Hong Kong actors' professionalism. Nothing like that happened."